One of the great things about Southwestern New Mexico is that one has access to incredible hiking opportunities almost 365 days a year. 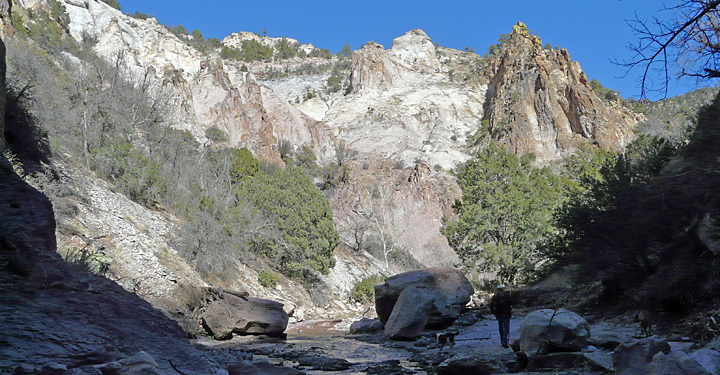 With over two-thirds of the landscape open to public access, the diversity of available hiking in this part of New Mexico is essentially unlimited: from vast expanses of lowland Chihuahuan desert to the soaring alpine peaks and meadows of the Mogollon Mountains, from the deep mountain canyons of the Gila Wilderness to the gently-rolling piñon-and-juniper-dotted grasslands of the Burro Mountains. And no matter which hike one chooses, typically you will have the trail all for yourself to enjoy and not see another person during the course of the day. As it has been throughout its history, Southwest New Mexico is still a place where pristine Nature dominates, and humans are few and far between. Perhaps the greatest difficulty faced by a short-term hiking enthusiast visitor to this landscape is in deciding which one of the numerous hikes to take. Hiking, of course, is a highly personal type of recreation depending entirely upon one’s interests and abilities, but the variety of hikes that are available here should satisfy all who visit. People hike for various reasons. For some, it’s all about getting out, stretching the legs, and exercising the body, a proven prescription for continuing good health. For others, it’s more a means of pursuing a particular interest or favorite form of mental stimulation, be it birding, rockhounding, archaeology, or another aspects of natural or cultural history. And then there are those difficult-to-describe or ineffable reasons, those subjective and intangible feelings that seem to flow from deep within one’s being or Soul, which at the end of a day leave one in that unique state of mind that only emersion in pristine Nature can instill. 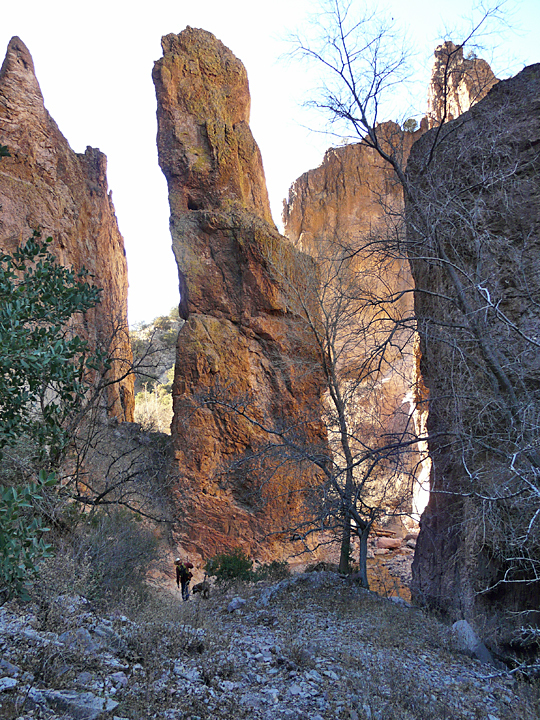 Of the countless hikes available that one can take in Southwest New Mexico, it can be safely asserted that there are more opportunities and options to pick from than one could explore in one’s lifetime, regardless of one’s interests. 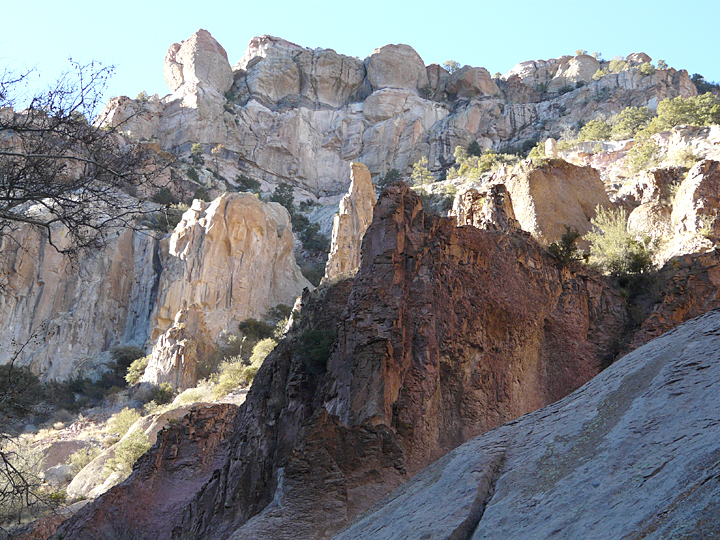 Like rocks, in New Mexico there are really only two kinds of hikes: good hikes and better hikes. All hikes will satisfy at least one or two of the three reasons noted above for hiking. However, here and there are those “special” or “perfect” hikes, those hikes that not only satisfy all three of the reasons, but do it so consummately as to keep one coming back again and again and again. 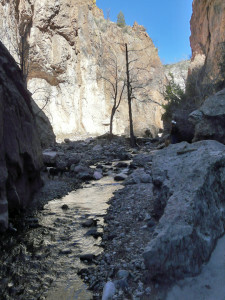 Such a hike is Mineral Creek, Gila National Forest Trail 201. Having enjoyed several highly-memorable hikes up Mineral Creek in the past, it had now been three years since the last visit, and one was anxious to return. 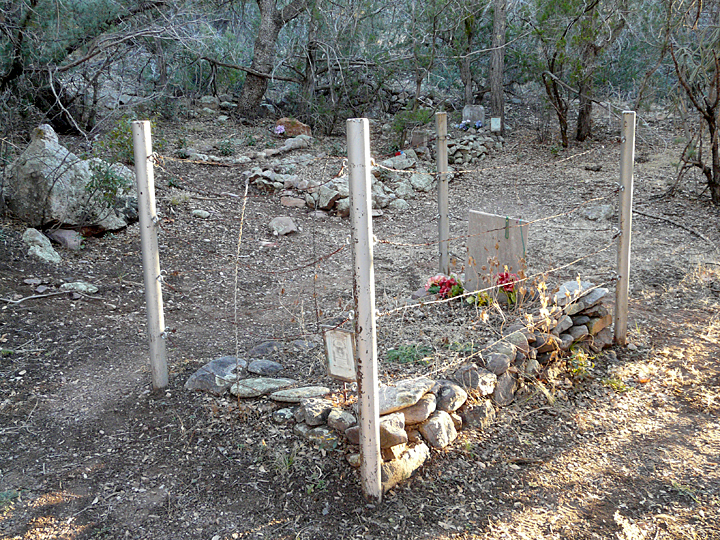 While a return visit had been anticipated for the Fall of 2013, that trip was summarily cancelled with the overnight happening of the Great Mogollon High Country Flood of September 15, 2013, in which all access to Mineral Creek, the Catwalk Recreation Trail, and Mogollon ghost town was rendered impossible. On that date, a persistent complex of stationary thunderstorms dropped 10 inches or more of rain over a 10-hour period in the highest elevations of the Mogollon Mountains in an area encompassing the headwaters and upper drainage basins of Whitewater and Silver creeks. 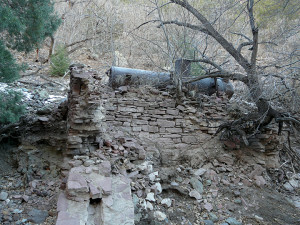 As a result, the Catwalk Recreation Trail along Whitewater Creek and the town of Mogollon on Silver Creek suffered extreme and extensive damage to both infrastructure and access. Accordingly, each of these locations has required massive restoration efforts which are still in progress as of this date, but should be completed by late spring of this year. 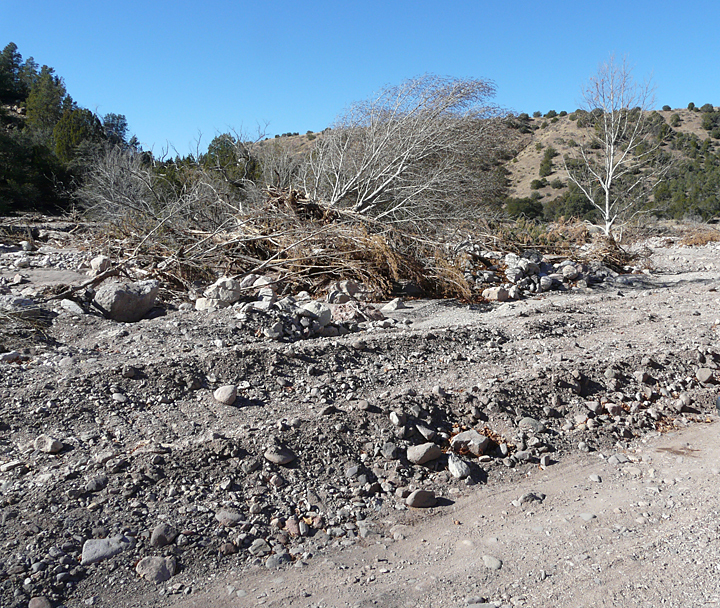 While the status of conditions at the Catwalk and Mogollon were quickly ascertained following the flood, the degree of damage to the Mineral Creek Trail could not be determined and remained a mystery up until a few weeks ago. 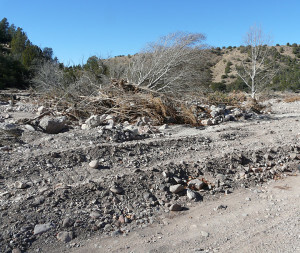 This was due to the fact that the lower four miles of the six-mile county-maintained gravel road leading to the trail head were either washed out or buried in deep mud and debris by the flood, rendering travel to the trail head impossible. 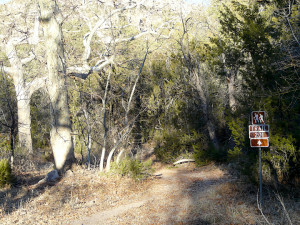 Finally, in early January, word was received that Mineral Creek Road had been rebuilt and was open to the trail head. Nothing certain, however, was known of the status of the trail itself. 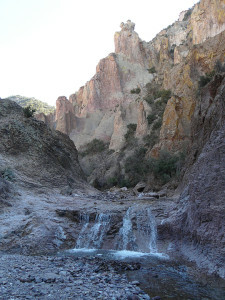 Since the Mineral Creek Trail has always been a favorite hike for guests staying at Casitas de Gila Guesthouses, a reconnaissance hike was definitely in order! January 15, 2014, dawned clear as a bell. The small front that had passed through a few days previously was now gone, and high pressure had moved in, along with the cold nights and warm, sunny days that are so typical for this time of year. 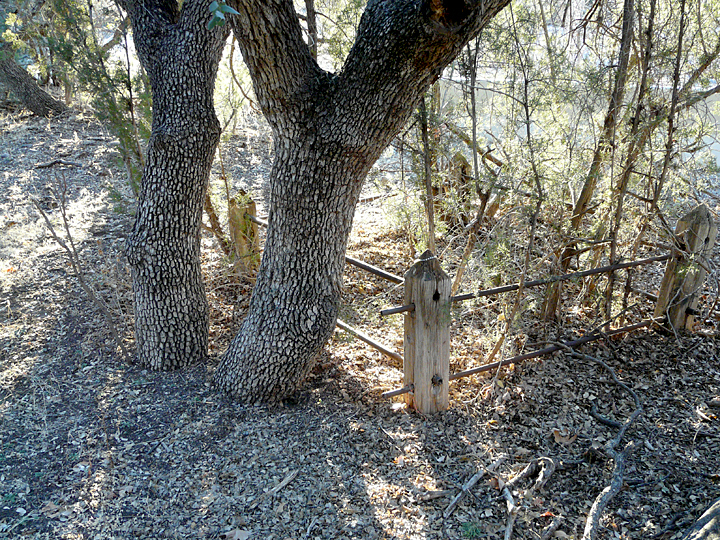 It was a perfect day for hiking and renewing connections with one’s favorite hiking spot. 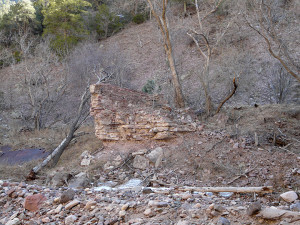 Looking downstream from repaired road at crossing of Mineral Creek just above junction with Silver Creek Canyon on January 15, 2014. 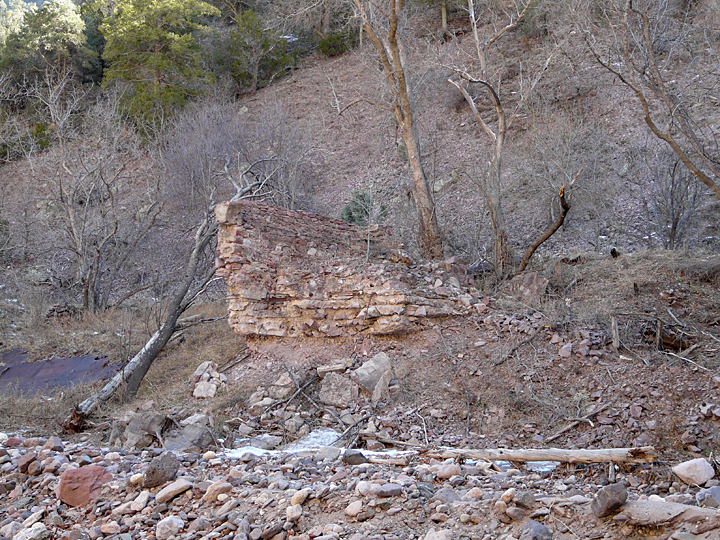 Boulders and debris in middle of photo are remnant deposits from September 15, 2013 flood waters, which came down Silver Creek Canyon to left of this photo. Unsubstantiated rumors and speculation gathered over the previous few weeks had it that while Mineral Creek Road itself had been wiped out, the Mineral Creek Trail itself had been largely untouched. 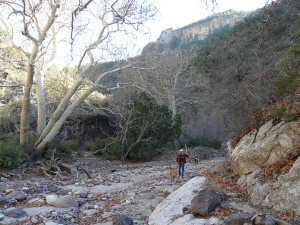 This might seem a strange contradiction unless one knows that Silver Creek Canyon, which comes down out of the mountains after passing through the town of Mogollon, joins with Mineral Creek Canyon about two miles downstream from the Mineral Creek trail head. Mineral Creek, Silver Creek, and Whitewater Creek are all found within deeply incised, adjacent and parallel canyons that drain out of the Mogollon Mountains from east to west, with Mineral Creek on the north and Whitewater Creek on the South. So, if indeed the thunderstorms that caused the flooding in Mogollon and the Catwalk were centered just a little bit to the south of the Mineral Creek Canyon drainage, it was totally possible that the rumors were true, and that the Mineral Creek Trail had come through the flood largely unscathed. Riding north from the Casitas de Gila Guesthouses that morning, we were anxious to find out! Leaving US 180 at Alma, Mineral Creek Road runs four miles east along the north side of Mineral Creek to the point where Silver Creek Canyon joins Mineral Creek. At this point the road crosses Mineral Creek to continue along the south side of the Canyon another two miles to the trail head. While much evidence of the severity and great magnitude of the flood still could be seen in the first four miles, the road itself had been well repaired, and easy access to the trail head is once again assured. Pausing briefly at the junction of Silver Creek Canyon and Mineral Creek, it was obvious that the rumors were true, that indeed most of the flood waters that had caused the damage downstream to US 180 had come down Silver Creek Canyon. 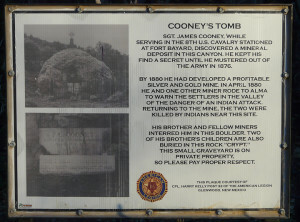 Proceeding onward to the trail head, Cooney’s Tomb and the small pioneer cemetery behind were found intact and not at all damaged, although it was obvious that flood waters had covered the road in front of the tomb. From the trail head and parking area, a well-marked trail takes one along a steep bank on the south side of the Mineral Creek Canyon floodplain for a few hundred yards before dropping down to the creek. 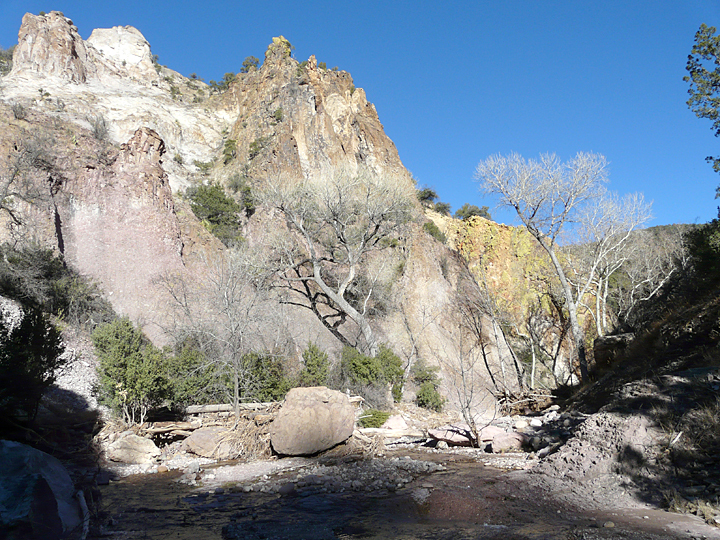 At this point, the landscape changes dramatically as a high-angle north–south fault marking the edge of the up-thrust Mogollon Mountain front is crossed and high canyon walls immediately close in on both sides of the creek. From this point on, the trail is confined to a very narrow canyon with sheer cliffs of brilliantly multi-colored layered volcanic rocks rising up a thousand feet or more on each side. 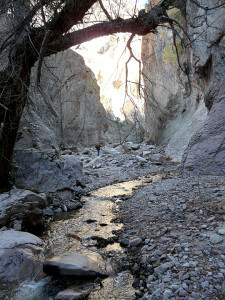 The trail itself migrates from side to side of the canyon. Sometimes the trail is obvious and readily followed as it passes through groves of old growth sycamore, ash and cottonwood; in other places the trail is totally absent as it crosses lengthy stretches of water-worn bedrock or floodplain gravel, but never straying more than a hundred feet or so from the creek itself. 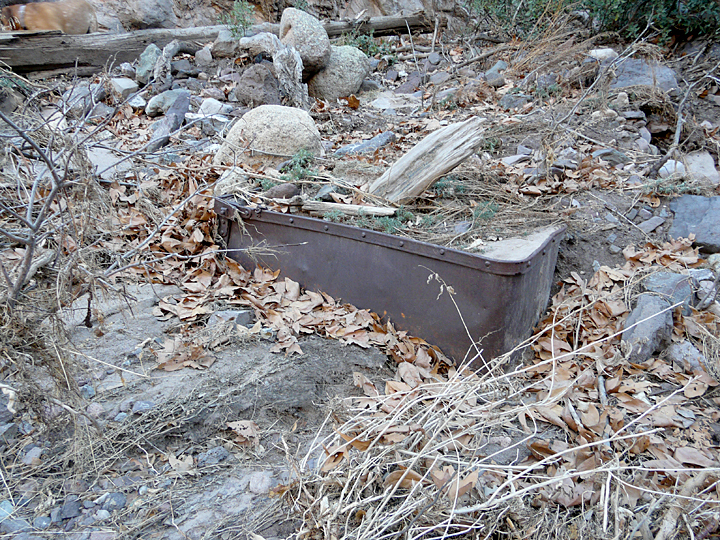 For most of the year, except during Spring runoff and Monsoon Season, water levels in the Creek are minimal, averaging about five feet across and less than a foot in depth and in most places easily crossed on the ever-present boulders or logs that litter the valley floor. And so the trail continues upstream for about a mile and a half until the sites of the old mining settlement of Cooney and the mines are reached. 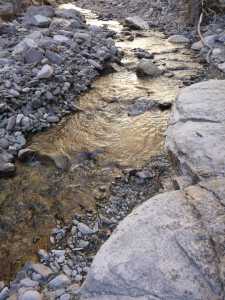 In the shadowed canyons, Mineral Creek flows golden in the reflected morning light. Mineral Creek remains to this day a magical place where the spirit of pioneer New Mexico can be sensed at every turn. It is impossible to separate the natural and cultural history of Mineral Creek, so closely are they intertwined. 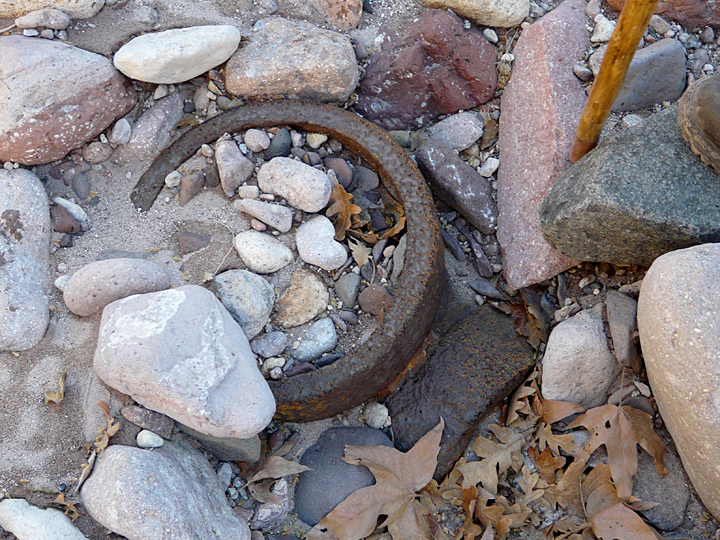 The earlier blog “A Time-Travel Hike Up Mineral Creek to Cooney Camp and Mine” focused on some of the key elements and events that have shaped this microcosm of New Mexican history. 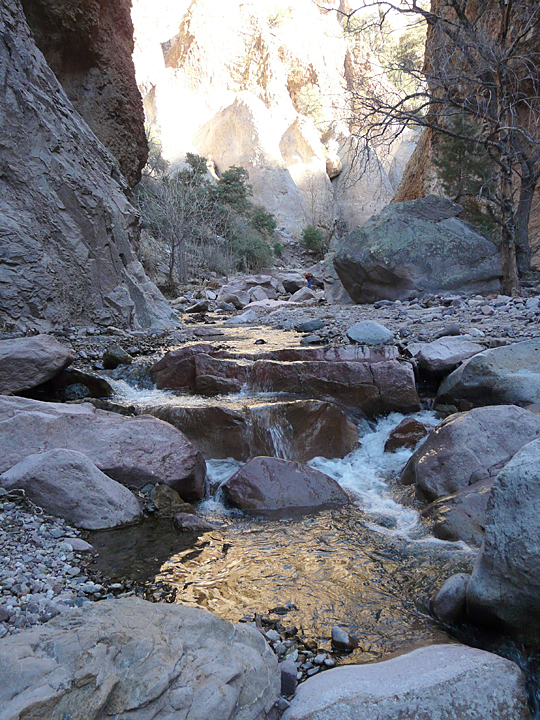 While many places in New Mexico share similar stories both geologically and culturally, Mineral Creek is unique. 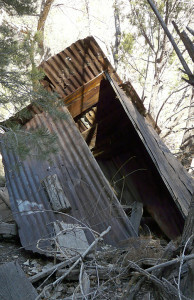 A two- or three-hole outhouse across the creek from the old mill site. Oh, what stories this could tell! 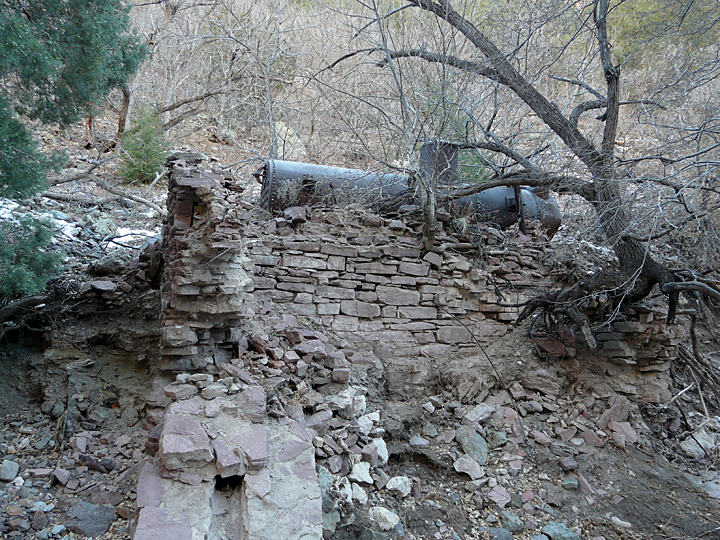 Part of the foundation of one of the three crushing and concentration mills that treated the raw ore from the Mineral Creek Mines, possibly the 100-ton Mogollon Gold and Copper Company Mill. Geologically, rugged Mineral Creek Canyon is quite complex, its sheer walls revealing a multi-million year history of volcanic eruptions, upheaval, and eventual emplacement of rich deposits of gold, silver, and copper along ring faults of the collapsing Bursum Caldera. 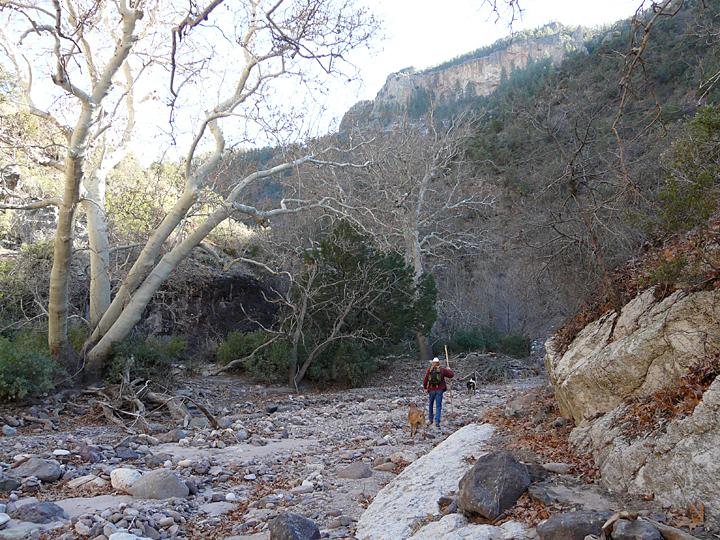 Today, a hike up Mineral Canyon offers an extremely satisfying journey into the beauty and solitude of Nature Pristine, where civilization disappears and only the murmuring creek and rustle of the sycamore leaves break the omnipresent silence. Yet little more than a hundred years ago this little canyon was home to a small, but booming, mining camp of some 300-400 souls. There were numerous mines, claims, and prospects here in addition to Sergeant Cooney’s Mine that started it all; their names reflecting the hopes and dreams of their finder, such as the Old Strike Lode, the Leap Year Lode, the Free Milling Lode, and the Silver Bar. 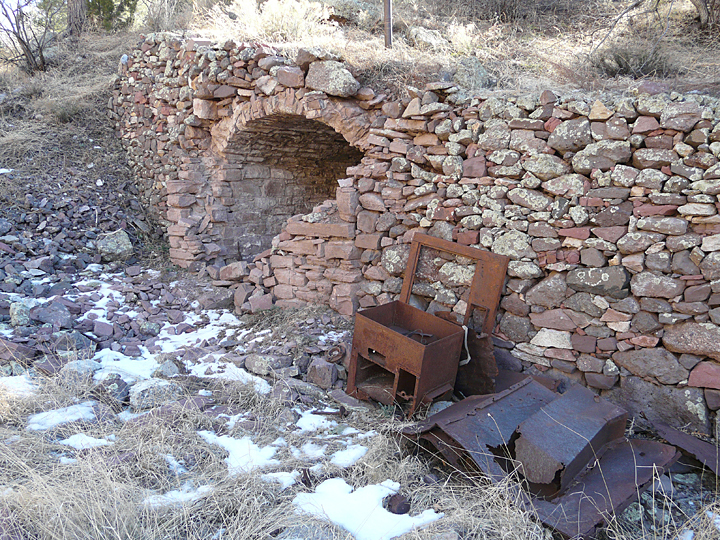 Serving these mines were three ore processing mills, such as the impressive, 100-ton per day Mogollon Gold and Copper Mill, where the raw ore was crushed and concentrated before beginning its long journey by huge, mule-drawn freight wagons down a road laboriously constructed through the narrow Mineral Creek Canyon by hand labor to far off smelters in Silver City or El Paso. 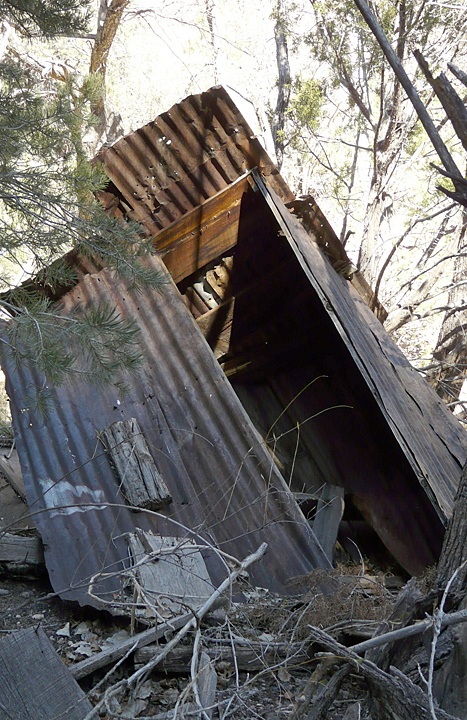 Only a few fragmental records, reports, and a few anecdotal stories remain today regarding the initial discovery of these riches, the ensuing years of blood, sweat, and tears development and exploitation, and the eventual abandonment of this all-but-forgotten late-1800’s mining camp. Yet for the observant and inquisitive hiker on Mineral Creek, here and there, half-hidden amongst the trees or flood plain boulders, evidence of these bygone days can be discovered along the creek in the form old stone foundations, rusting pieces of mining equipment, rotting timbers, mysterious stone retaining walls, and curious bits and pieces of unknown origin. When viewed in context of the old stories and records, these few remaining artifacts can add a sense of mystery to one’s rambles, as well as a heightened sense of awe and respect for the ingenuity and determination these hardy miners and pioneers who chose to deal and play out the hands of their lives in the depths of this little canyon. 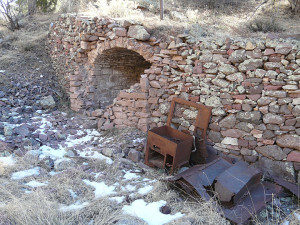 Extensive stonework foundation, arched stone vault, and rusting equipment downstream from Cooney Mine. Assay laboratory? Besides evaluating the access to and conditions along the Mineral Creek trail, a second primary personal objective of this particular day’s hike was to investigate some of the geology and associated mineral deposits further up the creek from where one’s previous hikes had ended. After the first quarter-mile journey up the trail, it quickly became obvious that the September 15 flooding on the creek had not adversely affected the trail in any substantial way. In places, it was obvious that creek banks had been scoured away, and here and there a freshly downed cottonwood or a pile of flood-carried vegetative debris would be found across the floodplain, but nothing that would seriously degrade either the physical or visual enjoyment of the hike. If anything, at least to this geologist anyway, the flood waters had actually improved the enjoyment of the morning’s hike by scouring all of the transported sediment, boulders, and underlying bedrock down to fresh, squeaky-clean surfaces, revealing their true unweathered colors and textures that now sparkled in the morning sun! Once assured that the physical aspects of the trail were as good, if not better, as on previous visits, several conscious efforts were made at speeding our progress up the canyon to reach the terra incognita portions that lay ahead. But it was not to be. Over and over again, forward progress was thwarted, demanding a full stop, as the overpowering visual feast of the morning light beaming into and reflecting within the canyon walls presented a never-ending series of incredible photo opportunities. While the light in Mineral Creek Canyon is always special, never during all of the previous visits, or any other hike in memory for that matter, had one experienced the light that was present in that canyon that morning. As we entered the towering, sheer-walled slot canyon portion of the hike, and much to the dismay of one’s hiking companion, patiently waiting 100 yards ahead, forward advance slowed to an absolute crawl, measured in 20 to 30 foot increments at a time, as each new gold-rippled pool or illuminated canyon wall demanded one’s attention. How ineffably marvelous it was! Passing in and out of the magic light we slowly made our way up the canyon to finally arrive at Cooney’s mine and lunch at 2:00 PM, about 2 miles and 15 minutes shy of 3 hours into our journey. Average speed: 0.75 miles per hour. The sun was now on its way down behind the towering southern walls of the canyon, cutting the lunch break short as deep-blue shadows and mid-winter chill slowly enveloped our briefly-illuminated spot on the north side of the creek. The terra incognita objective ahead would remain unaccomplished for today … maybe next time. It was time to return. 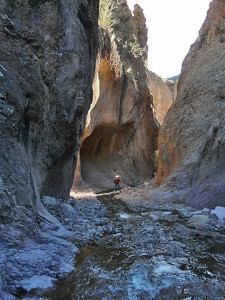 Mineral Creek Canyon runs from east to west. Thus, the Magical Light of Morning soon became the Magical Light of Late Afternoon, and much to my hiking companion’s returning dismay, every photo opportunity of the morning called out for renewed and repeated attention. So we returned as we had come. Slowly. Although, it must be said, a little faster; the return only taking 2-1/2 hours … 0.8 miles per hour! 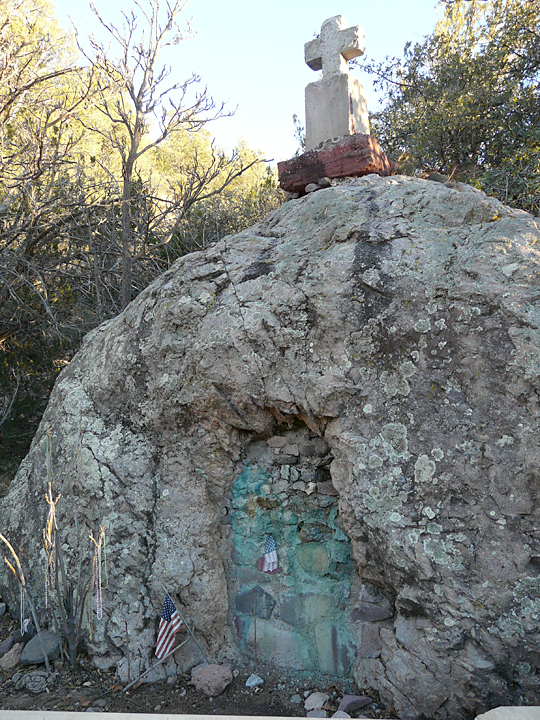 Three-quarters of a mile down the road after leaving the trail head, rays of the rapidly-setting Sun were illuminating the cross at the top of Cooney’s Tomb as we made our final planned stop. Here, in the silence of the small cemetery behind, one watched as the last of the fading light filtered through the leaves of the spreading oak tree overhead to honor the blue-shadowed graves of those intrepid miners of long ago with accents of glittering gold. It was somewhere between Cactus Flats and the Moon Ranch that one’s hiking companion made the mistake of uttering one of those “Wow, look at that!” comments. Respectfully answering the call, this in turn triggered a “Quick, pull-over!” response from the passenger. To the east an amazingly-large full moon was rising majestically over the Mogollons, lending its own magical light to one last photo (number 283!) at the end of a perfect day. NOTE: The Mineral Creek Trail, Gila National Forest Trail 201, offers an excellent easy-to-moderate two-to-four mile day hike in a spectacular canyon in the Mogollon Mountains that is suitable for all ages and abilities. 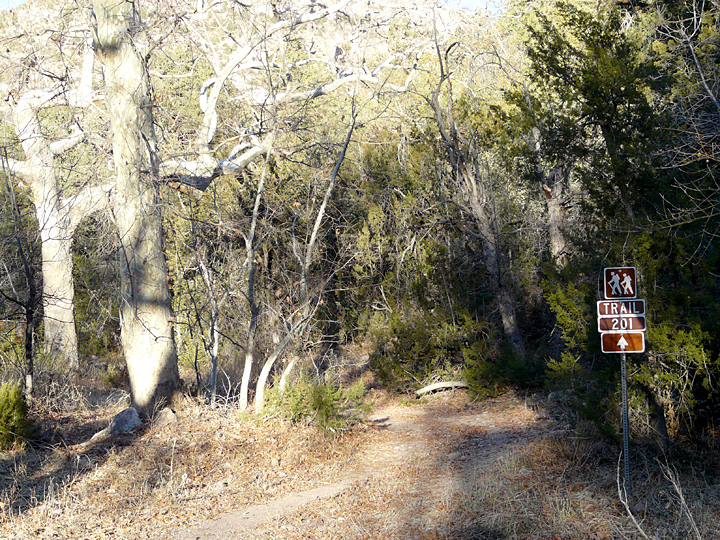 The trailhead is accessed from a maintained County road suitable for all types of vehicles. 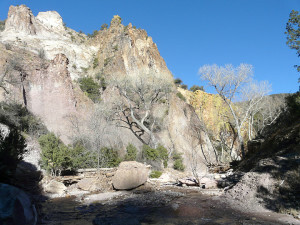 The first two miles of this trail, which continues deep into the Gila National Forest, follows a mostly easy-to-follow route upstream along the bottom of Mineral Creek Canyon. Because of the significant threat and danger of unpredictable flash floods in this very narrow, sheer-walled canyon, it is strongly recommended that the Mineral Creek hike NOT be attempted during the annual Summer Monsoon that runs from July 1 through mid-September. 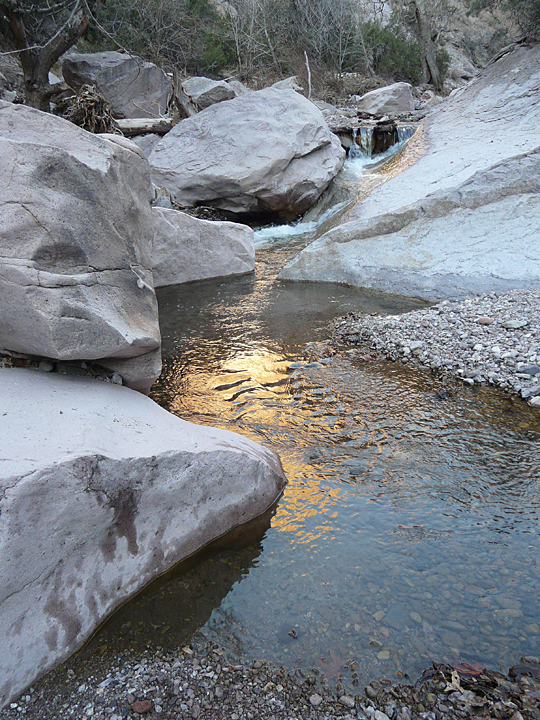 While there is water in the creek year around (with the exception of mountain snow runoff in the Spring, and the Summer Monsoon Season), creek widths and depths are minimal with ever-present boulders and logs to facilitate the countless required crossings of the creek. Most hikers will find that the hike does not require much strength or endurance. However, because of the rocky, rough terrain and boulder-hopping on the numerous creek crossings, a walking stick may be extremely useful. Should you forget, Mother Nature thoughtfully provides an abundance of dead sticks along the creek that will serve quite well. Water in the Creek, although pristine and clear, will require purification because of the presence of the protozoan parasite Giardia. Ample drinking water, sunscreen, long sleeves and pants, and a wide-brimmed hat should considered essential. The trail for the first two miles is generally accessible year around. Beyond that distance, snow and ice may be encountered during December, January, and February. 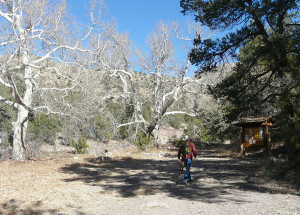 As always, Casitas de Gila Guesthouses will provide their guests up-to-date weather and likely trail conditions, directions, and maps for any of the hikes in the area. 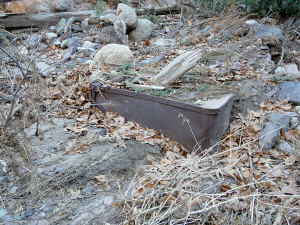 This entry was posted in Gila National Forest, hiking, Mineral Creek, mining and tagged hiking, mining. Bookmark the permalink.